ROME - Because the Roman Catholic Church was a driving force behind the development of a common English translation of basic prayers used by many Christian churches for 40 years, more recent Vatican rules for translating Mass prayers "came as a bombshell," said an Anglican liturgist. "I do not contest for a moment the prerogative of churches to change their liturgical texts," said the Rev. David Holeton, a professor at Charles University in Prague. But he said other Christians were "both stunned and dismayed" when the Vatican abandoned the English texts of prayers Catholics had developed with them since the Second Vatican Council and when the Vatican discouraged Catholics from consulting ecumenically on the new translations. The Anglican liturgist spoke May 5 at a conference marking the 50th anniversary of Rome's Pontifical Liturgical Institute. VATICAN CITY - The Vatican said the killing of al-Qaida leader Osama bin Laden, a man who sowed division and hatred and who caused "innumerable" deaths, should prompt serious reflection about one's responsibility before God, not rejoicing. "Osama bin Laden, as we all know, bore the most serious responsibility for spreading divisions and hatred among populations, causing the deaths of innumerable people, and manipulating religions to this end," Lombardi said. VATICAN CITY - "John Paul II is blessed because of his faith -- a strong, generous and apostolic faith," Pope Benedict XVI said May 1 just minutes after formally beatifying his predecessor. "I would like to thank God for the gift of having worked for many years with Blessed Pope John Paul II," he said. As prefect of the Congregation for the Doctrine of the Faith from 1982 until his election in 2005, Pope Benedict said he worked at the pope's side "and came to revere him." "His example of prayer continually impressed and edified me: he remained deeply united to God even amid the many demands of his ministry," the pope said. VATICAN CITY - Blessed Pope John Paul II worked a number of miracles at his beatification, some pilgrims said. Weather forecasts of a weekend of heavy rains turned into innocuous grey clouds April 30 and then sunny skies May 1. "We prayed to John Paul that it wouldn't rain," said Josephine Faehrmann from Sydney, Australia, who was planning to sleep outside with her friends. Also, mysterious benefactors with a special devotion to the Polish pope paid for a bus full of young people from Naples to attend the ceremonies "because John Paul II loved young people and we had to be here," Rosa Giordano said. 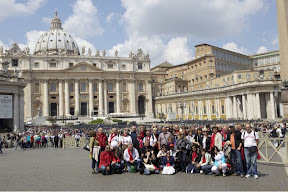 Each of the more than one million people of every age, background and nationality attending the April 30 vigil in Circus Maximus and May 1 beatification in St. Peter's Square had his or her own story of pilgrimage. Danila Fabrizio, another member of the group that left Naples at 1 a.m. May 1 on the benefactor's bus, said, "This is a sign of God's providence that we're here." The following is an entry from the Archdiocese of Toronto Blog. Their team have set up a special webpage, archtoronto.org/jp2, to celebrate the beatification of Pope John Paul II. You can also follow proceedings on their facebook and twitter accounts. Saturday evening in Rome at Circus Maximus, an estimated 200,000 pilgrims from around the world gathered to remember, pray and celebrate the life of Pope John Paul II. It was a homecoming of sorts, a mini World Youth Day that included young people and veterans of WYD who are now in their 40's and 50's. Of course, Polish flags were predominant throughout the celebration, which included moving testimonials from those close to JPII (his press secretary, Dr. Joaquin Navarro-Valls and his personal secretary, now Cardinal of Krakow Stanislaw Dziwisz). Another moving tribute came from Parkinson's survivor Sr. Marie-Simon Pierre Normand, the miracle cure of her sickness attributed to the late Pontiff. She spoke of praying the luminous mysteries with her religious community and the profound impact JPII had on her own life. Archdiocese of Toronto Blog. Their team have set up a special webpage, archtoronto.org/jp2, to celebrate the beatification of Pope John Paul II. You can also follow proceedings on their facebook and twitter accounts. Up for 24 hours + can be an interesting feeling. Not getting much sleep on a flight across the ocean is nothing new. So when you arrive in Rome at 7:30 a.m. you have two options: a) sleep and stay on a very strange body rhythm schedule or b) acclimatize as best you can and try to adjust to the new timeline as soon as possible. So Emanuel and I chose the latter road to travel today. We picked up our media accreditation which will provide us with some excellent access to various sites throughout the next several days. The traditional Vatican Press Office has been expanded to include a Temporary Accreditation Centre, regular home to the Pontifical Council of Social Communications to accommodate the thousands of communicators expected to descend on Rome. The weather Thursday in Rome was beautiful, about 20 degrees celsius, a little cloudy and breezy but the sun crept throughout most of the day. Walking through St. Peter's Square it's evident that plans are in full swing to prepare for the weekend events with everything from portable toilets to security barricades and other prep underway. Estimates at this point are that at least 1 million people will be making the trek but hard to know what final numbers will look like. Stepping back, at any given time, if you're to peruse the crowds, many in national colours, you'd see a Canadian, German & Polish pilgrim walking side by side, hand in hand or even singing together as they all come together for this most joyful occasion. Public transit is the way to go here so we managed a few subway rides - interesting to note that to accommodate the massive crowds, subways will run from 5:00 a.m. - 1:30 a.m. Saturday and 4:00 a.m. - 1:30 a.m. Sunday morning. All that said, you can expect that some stations may experience temporary closures, as they did in the Jubilee year for World Youth Day 2000 when it just wasn't safe to allow any more pilgrims into the subway. I can still recall leaving the final mass at WYD Rome at about 11:00 a.m. and making my way back to our meeting point at the end of the subway line about 7:00 p.m. In between, there was a walk of about 20 km, 5 subways stops closed and 40 degree heat. Ah yes, pilgrimage at its best. Why do I get the feeling we may be prepping for the sequel? We also had the chance to connect with Archbishop Collins along with his M.C. Fr. Ed Curtis for a rooftop interview that will likely remain an exclusive - trust me when I say there was some great lines but remember that part about technical difficulties? Well let's just say that we'd prefer that you be able to understand the wisdom of His Grace and not be fighting the mighty wind that was present on the rooftop - we'll try for a retake at some point in the next few days. As for media coverage at this point, we've got strong interest from the Toronto Star, 680 News, CBC and a few others that we're working on, both from Rome and the home office in Toronto. Suffice it to say, most folks back in Canada will likely enter Royal Wedding mode Friday but we'll be stopping by the Canadian College to visit with some of our Toronto priests, attend a Vatican press conference and work on some more proactive media opportunities. So it's just about time to work on a little sleep given that this has been one of the longer work days of the year. After dinner with pilgrims from Windsor, Bradford and Etobicoke, one might say that we're off to a great start. In short to recap, Rome is well on the way to setting the table for a million friends to come for a visit...first come, first served. Should make for quite a line for this buffet of faith! VATICAN CITY - The Vatican's special exhibit hall wasn't big enough to honour the life and ministry of Pope John Paul II, so the exhibit begins in St. Peter's Square, said Barbara Jatta, curator of what is described as Pope Benedict XVI's special tribute to his predecessor. "The exhibit begins in the square, which for the first time ever for a beatification, is decorated with one large photograph of the pope with his pastoral staff as well as with photographs from each year of his pontificate," Jatta told reporters April 28. In addition, she said, "the exhibit leads directly to the basilica where people can venerate the tomb of Pope John Paul II." Visitors can enter the main exhibit, housed in the Carlo Magno Hall off of St. Peter's Square, until July 24 for free. The exhibit is a collaborative effort of the Vatican governor's office and the Polish Ministry of Culture and National Heritage. VATICAN CITY - Hundreds of people have been giving public witness to the ways Pope John Paul II changed or even saved their lives. Men and women of all ages and nationalities have sent personal stories to www.karol-wojtyla.org, a web site run by the diocese of Rome dedicated to the late pope's beatification and canonization. As of April 28, the multilingual site published more than 400 testimonies from people sharing the ways they feel Pope John Paul interceded on their behalf or brought them back to the Church. Many are notes of thanks for prayers answered, such as a risky surgery gone well or troubles in the family resolved. Others are personal accounts of meeting or seeing the pope during one of his many trips abroad and the feeling of being in the presence of a holy and charismatic man. Others were influenced by the way Pope John Paul reached out to people in every walk of life. One woman wrote that she was driven to prostitution to support her family and had lost her faith in God. "I ask for pardon ... in a moment of anger, I tore your picture to pieces," she wrote. VATICAN CITY - Pope John Paul II deeply influenced generations of Catholics who knew him in life, but his most enduring legacy — his teaching — is something that will continue to impact the Church for centuries, a biographer of the late pope said. "It's going to be several hundred years before the Church really takes on board the breadth and depth of this man's explication of the Gospel, and in that sense we're going to be thinking, and arguing, about John Paul II for hundreds of years," said George Weigel, author of the papal biographies Witness to Hope and The End and the Beginning. 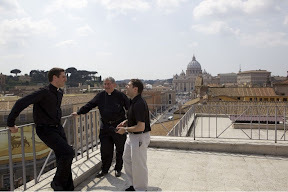 Weigel said that six years after the pope's death his connection with young people continues to bear fruit in many ways: in priesthood vocations over the last decade, in women's religious orders inspired by Pope John Paul and in renewal movements. "I look at my own parish in suburban Washington and see young couples raising Catholic families, who all took some form of inspiration from John Paul II. And I suspect this is replicated all over the world," he said in an interview April 27. VATICAN CITY - A small vial of Pope John Paul II's blood is the relic for the Mass for his beatification, the Vatican said. The relic was to be presented to Pope Benedict XVI and exposed for veneration during the Mass in St. Peter's Square May 1, the Vatican said April 26. After the Mass, it will be kept with other modern relics in the Apostolic Palace. The Vatican explained that four vials of blood were drawn from Pope John Paul during the final stage of his illness by his personal physician. The vials were sent to the Vatican-owned Bambino Gesu Hospital in Rome in case the ailing pope needed a transfusion, it said. VATICAN CITY - The city of Rome launched beefed-up security measures in the days before the May 1 beatification of Pope John Paul II. Officers were even brushing up on their English to better help the hundreds of thousands of pilgrims expected for the event. More security personnel and tighter passenger and baggage controls were put into effect starting April 25 for area airports, seaports and train stations. Italian authorities said there would be random bag searches and ID checks at the Leonardo da Vinci-Fiumicino airport, Civitavecchia seaport and Termini train station in Rome. People with criminal records and those who would be "potentially dangerous for tourists" were to be "moved away from" the area in and around Termini train station, reported the Italian daily, La Repubblica, April 24.